It’s hard to pin down exactly why it is such a pleasure to read, and reread, F.D. 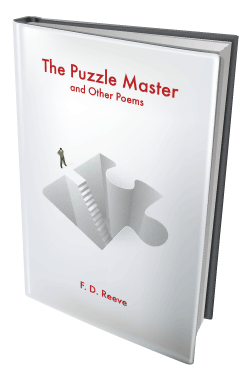 Reeve’s The Puzzle Master and Other Poems. The Wilmington poet’s 10th collection contains seven short lyric poems and a long, dramatic one — a play in verse called “The Puzzle Master” that takes up the last two-thirds of the book. Or maybe it’s the sheer range of cultural references Reeve draws on, indicated in that leap from French cars to the Dutch painter. In “For the Four Thousand,” the numbing distance of the war in Iraq recalls the biblical crèche scene, in which “no one includes the smell / of the animals or the air / at Golgotha three days old.” In “The Ghiberti Doors,” the early-Renaissance Baptistry doors in Florence designed by Lorenzo Ghiberti are an occasion to “Tote up the civil gains from then to now.” A Greek commemorative slab, a pewter vase, Ophelia’s bones — all these objects help Reeve explore how the past figures in the present. The 81-year-old poet and retired academic admits he isn’t always conscious of the poetic influences he has accumulated over his lifetime. “Think of all the things you have in the frigerator that you don’t throw out — the bottles of sauces and things. Then one night they come in handy,” Reeve jokes during a phone call from the house where he lives with his wife, novelist Laura Stevenson. Reeve, who moved to Vermont in the mid-1970s, has led something of a storied life. Mentored as an undergrad at Princeton by the influential literary critic R.P. Blackmur, he served as Robert Frost’s translator during the elderly poet’s meeting with Nikita Khrushchev in Russia in 1962. He taught at Wesleyan University until 2002 and has published some three dozen works, including translations and criticism of Russian literature and his own novels and short stories. And he’s the father of the late Superman actor Christopher Reeve, who died in 2004. That last fact, Reeve assures, has no bearing on “The Puzzle Master.” The dramatic poem is a rewriting of the myth of Icarus, who died young when he flew too close to the sun on wings his father had built, melting the wax that held them together. The “puzzle master” is Dedalus, who famously constructed an unsolvable labyrinth to contain the man-eating Minotaur, as well as a way out of it. Part of “The Puzzle Master” was set to music and performed at a cyber-arts festival in Boston in 2007, but Reeve says a different composer is now working on the full piece, which will be ready for staged performances in November. “It takes a long time to write music, [whereas] a poem can come very quickly,” Reeve notes. Joining those dead are, in other poems, the “anarchist dead” and the 4000 dead soldiers whose “each death draws closer to Hell,” to name but a few. Even the Earth seems only precariously alive.